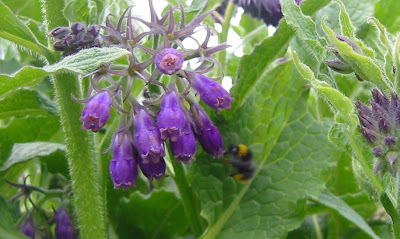 I've still not cracked photographing comfrey, I see something I can't persuade the camera to record. It must have some wavelength or aura that a mere machine can't get, but it entrances me nearly as much as it entrances the bees. It's slow progress in the garden. A lot of rain is impeding the tasks I'm keen to get on with, like the first mowing of the season, sowing of seeds and putting up of bean poles. It's not that it rains all the time, just enough to keep the grass damp and the soil soft so that the mower blades clog up and I fear that my boots on the newly turned plots will compress and solidify the earth into bricks. Yesterday I planted a few small rows of herbs, rocket, coriander, dill, some parsley (although I'll start more of that in pots, it's so slow to germinate), something else I've forgotten already but I'm sure I'll recognise it when it pops up and half a dozen sunflowers in a line with the horseradish, more because it kept it tidy than as part of a great plan. I also created a couple of bean pyramids from hazel stick coppice although I haven't planted the beans yet. Today, I'd just got one row of carrots settled, Nantes, when the rain came down again and drove me indoors. Other tasks attempted and rained off today include more lawn mowing and collecting the chainsawed stems of the hazel that EDF butchered when they (rather unnecessarily) cleared their lines. I hope they don't charge us for that. There is a lot of work to do with sowing seeds in modules and pricking out seeds already germinated but kittens are the inhibitors there. My usual nursery spots for such things are the windows sills of my office room and these have been taken over by kittens who have no respect for potted plants when there are bluebottles to catch. It's a bit of a problem, I can't close the room off entirely because I use it a lot and there are some trailing wires for telecomms but the cool weather means other outdoor spots just won't do. I suppose I should stop worrying but these are my main tasks for the month. It would be nice to be successful with them. its funny what you say about the comfrey - whenever i photograph violets or bluebells the colours are different, yet my camera is really accurate for those colours when they are not flowers! i think comfrey is some sort of magical plant so maybe you aren't far wrong with the aura theory! re the window cill - i had a sort of two story plank arrangement on the kitchen window cill so i could fit in more seed trays - maybe if you construct something like that but with nothing on the bottom shelf? i thought puppies were bad but at least they can't climb! Hi Joker, sorry the reply is a bit late! I fabricated a sort of shelf with a plastic box on its side which has worked so far.